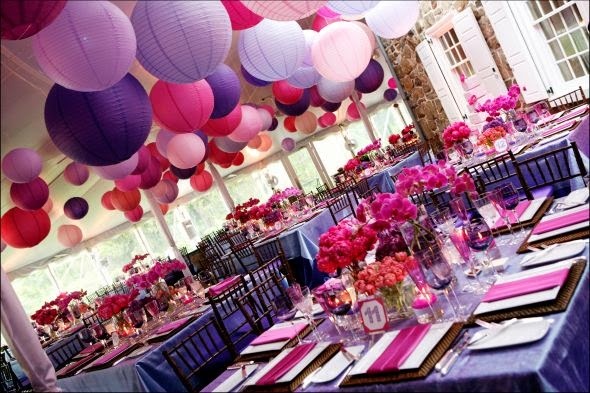 Pink and purple are two of the most beloved colors for weddings, and together they are twice as nice! A romantic color scheme with a nice balance of pale and deep shades, you can really do a lot with this color duo. 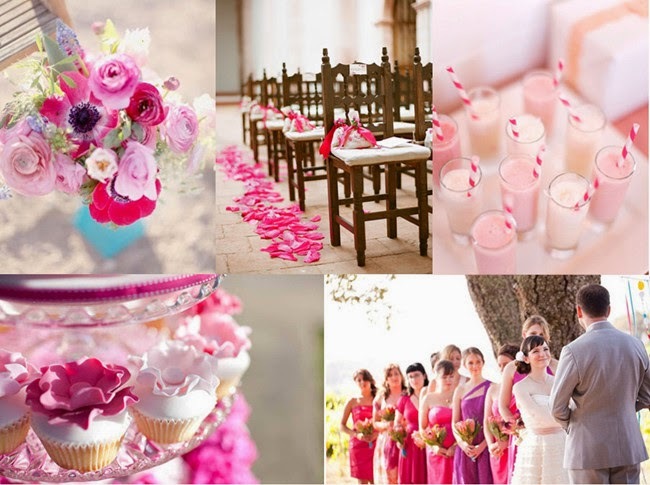 These are some lovely ideas on how to use a pink and purple wedding color palette to create a very special wedding. There are lots of pinks and lots of purples, and it is gorgeous to use a few shades of each in your wedding, particularly for the flowers. Pink and purple do not have a lot of contrast inherently, so the range of depth and tone will help to keep things visually rich and interesting. It works especially well if you select flowers which have a subtle variation of tone within each blossom, such as purple anemones with deeper centers, certain garden roses, and ranunculus. Sweet peas are a wonderful addition to pink and purple bouquets or centerpieces, as they come in lovely shades of both colors. Repeating some flower varieties in different hues will help to give your floral arrangements a cohesive look, even as you mix and match. 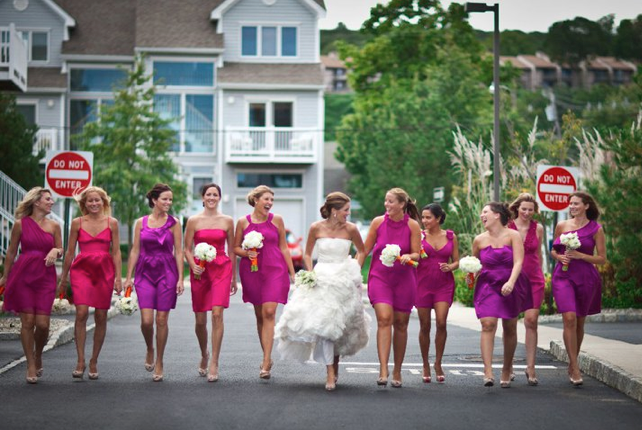 When choosing bridesmaid dresses, it will be prettiest to use slightly subdued versions of the pink and purple shades, particularly the pink. A classic rose pink will blend better than a bright bubble gum hue. Allow your friends to select their favorite shade of blush, rose, amethyst, lavender, or mauve. The colors will flow beautifully, yet each woman will get to show off her sense of individuality. Crystal bridesmaid jewelry in opalescent tones would be a gorgeous complement to all of the dresses. The opalescent crystal bridesmaid jewelry is a little different that the classic clear crystal, yet it is a neutral which will coordinate beautifully with any variety of pink or purple. For the reception, choose one main color for the table linens, and use the other as an accent. You need not use both equally. A pale lavender would be so pretty for tablecloths and napkins. Bring in the pink in the form of light rose menu cards with dark purple writing. Then you can use the full expression of the color palette in the centerpieces, which will look spectacular against the more monochromatic linens. At a formal wedding, centerpieces could be large arrangement in a riot of pinks and purples set in either tall fluted silver vases or grand footed urns. For a more relaxed and modern style, place a couple of stems in an assortment of small clear vases running down the middle of the table. That would be a great choice for long family style reception tables. Naturally you will want your wedding cake to feature your two signature colors. There are some wonderful ideas for a pink and purple cake. The most simple would be to use a variety of pink and purple flowers on a white buttercream cake. The flowers could either be fresh or sugar, depending on your taste and budget. Brides who love very girly things will adore a pale pink cake decorated with lavender swags and bows. For a more formal reception, pair pale pink with amethyst and gold to create a grand five tier confection with an ornate brocade design. A pink and purple wedding is the ultimate in feminine style and grace. The colors are widely available in flowers, attire, and decor, which will make planning a wedding in these hues very easy. 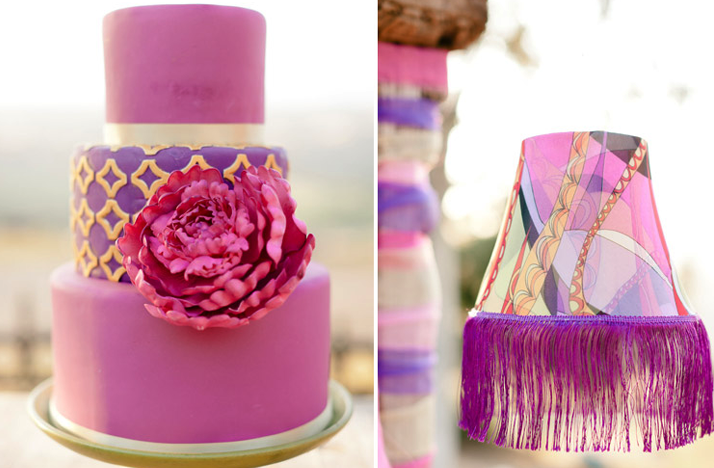 Pink and purple are definitely a lovely color palette for a wedding.